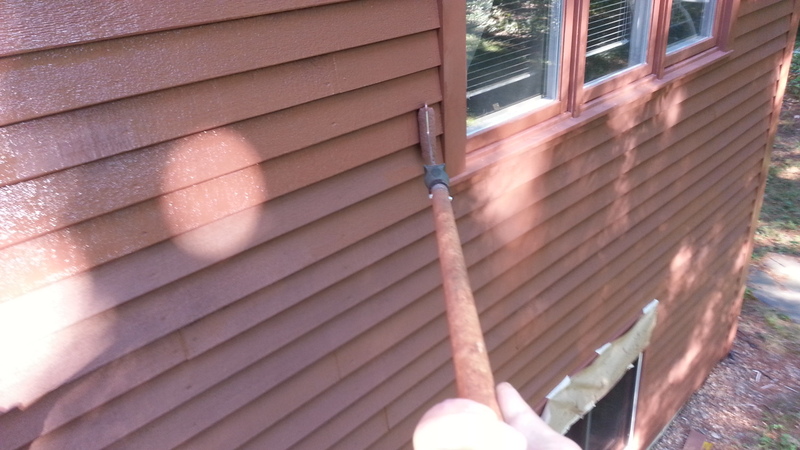 I was staining a lot of cedar siding boards. They were 1/2″ x 5-1/2″ by 12′ or 16′ long. I also wanted to stain the siding after it was up and needed to reach far from the ladder on both sides in order to keep a wet edge. 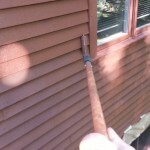 A standard paint roller was 9″ wide and would not work well on the siding that bevels and has 3-1/2″ repeat pattern. I found this long reach roller at my paint store and there were 4″ roller covers for it. It has a unique construction where the roller mechanics fit very tightly inside the roller cover leaving little room for paint, or stain in my case, to seep inside and make a cleanup nightmare. This Mini-Kote extended roller gives you an added two feet more reach. It’s actually 26-1/2″ long, but gripping it uses some of the reach length. It has roller covers from 4-1/2″ to 6″ wide in various nap lengths. Adding an extension pole into the screw-in bottom, I added another 2-1/2 feet giving me nearly 5 feet of reach on either side of the ladder. I was also able to screw in a 5′ broom pole and get nearly 7 to 8 feet reach. The tough polypropylene handle provides a solid grip and a solid screw in base giving you a secure feeling that you won’t break it while rolling 5 feet away. Applying the proper pressure and keeping it aligned while painting is tiring though. That extra reach comes at a cost of weight and control ability, so don’t plan on doing large areas that need long reach. Safely and easily reach far away from your ladder. I tried a couple of different depth roller covers, trying to get as much stain into the roller from each dip in the tray. If you load it too much, it gets heavy especially on an extension pole and it will drip like any roller normally does with too much paint on it. All the 3/8″ and 1/2″ rollers provided good performance and do not squeak while rolling. This is because the roller covers fit tightly over a rolling frame on the metal shank. This ensures little if any paint gets inside the roller tube. Cleanup was a breeze. When I pulled off the roller cover, the inner rolling frame was pretty clean and had stain only on the ends. Wiping the entire roller frame with mineral spirits left it looking nearly new and ready for the next job. I liked this roller and would recommend it to anyone wishing a long reach roller. Its sturdy construction gives it a professional feel and stays tight on the extension pole.